The day begins in the spa with a massage and sauna. My body is relaxing more each day. Here there are no worries about aggressive hawkers. A sweet young Nubian girl massages me, while the lyrical music of Kenny G pours through the spa into my head like liquid music. They were playing Kenny G at the airport too. Is that a coincidence? I venture a swim in the pool - five times around. The water is icy at first, but I become quickly accustomed to it. Peter has a full-body massage too, with a soak in the jaccuzzi thrown in for a negotiated price. It's fun meeting my husband in the spa. Then Peter and I go to lunch in one of the restaurants. In order to get to the restaurants you have to pass an entire mall of shops. This proves to be the next challenge - avoiding the pushy shop vendors. One has already started pestering us, ever since Peter admired his sandals. It's true - he needs to buy sandals, but must it be from this guy? We also have to pass Yassir, our travel service liaison, before finally finding refuge in the restaurant. He wants us to buy his package deal for Kalapcha, a Pharaonic temple on an island. We've already booked a trip to the camel market in Daraw. But he has so much planned for us. Peter pushes him off. In the afternoon we meet Mahmoud for our falouka ride. But he has to disappoint us. Today there is no wind. He offers us a motor boat ride instead, but fumes and noisy motors aren't our idea of a peaceful afternoon. Tomorrow we'll try again, inshalla, God willing, he says. But he instantly has another plan to entertain us. "My cousin getting married tonight - you invited as guests at Nubian wedding." We hem and haw. We don't know this man. We could get trapped! He sees our hesitation. No problem. He has another idea. "I take you to beautiful view of sunset, and when sunset over, I take you to the souk. He drives us up to his village, just above the boat landing. We're in a Nubian village, just what I wanted to see! 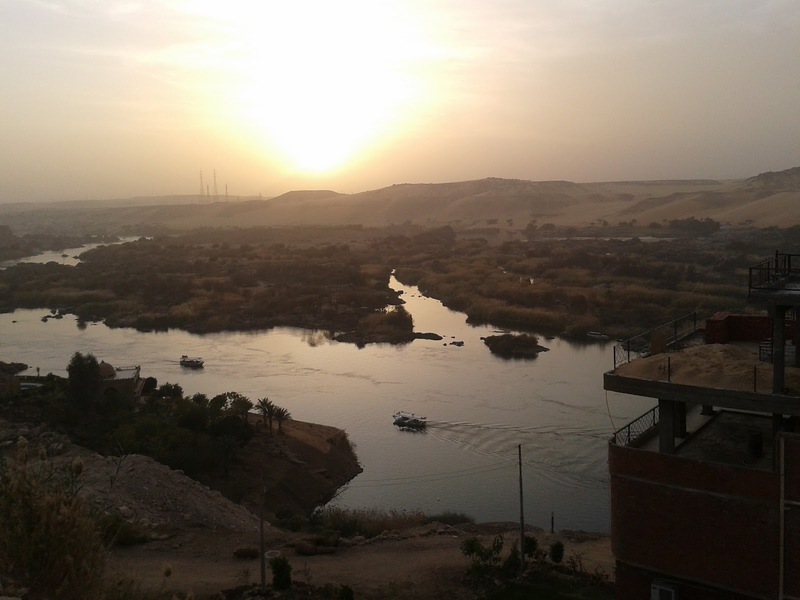 That was one of my goals, to visit a Nubian village. We drive along dirt roads and see little houses with jaunty symbols like falcons and crocodiles painted onto their houses with cheap paint. He takes us to some sort of large structure with a sand-filled courtyard with and mysterious rooms leading off from it, on to a restaurant with a dirt floor and reed ceiling, the walls painted in primitive Nubian designs. It is certainly exotic! There is a beautiful view over the Nile, where we will get a good view of the sunset - in about an hour and a half. How are we going to pass so much time with this strange man? We are assigned a table and order black tea with milk. Mahmoud disappears. After a while, he reappears and joins us. Peter seems to be completely out of his element in this spontaneous situation, so I initiate conversation with Mahmoud. I ask about the sailboat. It turns out he would have borrowed it. The car is borrowed too, we later find out. Here I assumed he must have a lot of money, having both a boat and a car at his disposition! But he's missing his front teeth, which makes me question just how rich he is. I ask him if he has a family, if he is married. He looks sad as he answers no, he is not married. He's the oldest of seven children in his family, and he has to look after all his siblings and his parents. There was someone he wanted to marry, but he didn't have enough money to pay her or for the wedding. Nubian weddings are very expensive. You have to hire musicians, lots of food, decorations, beautiful clothes. And pay the bride besides. She ended up marrying someone else and has two children now. That is truly sad, because he must be in his 40s. It's probably too late to find anyone else. He shows us a house, right next to the Nile, with a swimming pool. It's Muhammed Mounir's house, the famous Nubian singer. Look, he's also building a hotel next to the house. He seems surprised that we know of Muhammed Mounir. That's thanks to Burkhard from our last trip. Here's the link again if you didn't listen to him last time. What I hadn't realized is that Mounir is Nubian. Mahmoud seems proud of him. 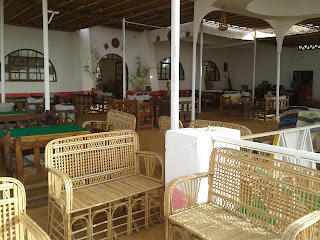 I'm sure that if Mounir gets his hotel built and the tourists ever start coming again, the entire village will prosper. By the time the sun is about to set, the sky is overcast, so our sunset is not as spectacular as we had hoped, but perhaps it's really our lack of ease being with Mahmoud for so long. We drive back to Aswan, but this time one of his friends is driving. No explanation as to why we suddenly have a different driver. Mahmoud's still with us, but he leaves us to ourselves when we tell him we'd like to look at the Coptic cathedral. A woman greets, giving us a private tour of the church. She's a member of the church. Her head is uncovered. She seems so western, so much more like our culture! She explains everything in the church to us. The cathedral is still unfinished, but I can't imagine that it will look any better when the finishing touches are done, filled with sentimental pictures in bright colors and gaudy chandeliers. She calls out to someone called "Abdul". I ask if he is Muslim. Oh, no, then he wouldn't be able to work in this church. But his name is Muslim, I say. She admires my alertness, assuring me that Abdul is a Christian. I ask about converts to Christianity, checking something I have read in my "Open Doors" literature. Open Doors is a Christian organization dedicated to praying for persecuted Christians. She says there aren't many ex-Muslim Christians right now. I ask her why. Because as soon as someone converts, she says, the family of the former Muslim will kill the person! Yet, people do become Christians, primarily through Jesus appearing to them in visions and dreams. But they tend to remain secret Christians, because of the danger to their lives. This is exactly what I have read. She says that it is rare for a conversion in the other direction. If someone Christian becomes a Muslim, it is because of marriage, or because money is involved, never because of any conviction of the religion being right. Mahmoud meets us outside the church, alone with "his" car again, and drives us to the souk, the bazaar. We have heard that this is one of the best markets in Egypt, perhaps the best. 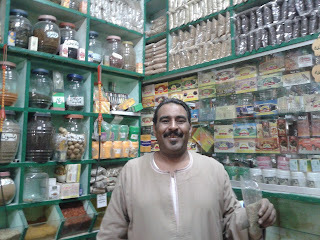 He wants to take us through the souk too, but we we want to be alone. He's almost like a friend by now, but we still don't know if we can trust him. We buy spices from a nice man. It's exciting, being on our own in an Egyptian city! Of course, Mahmoud later asks what we paid and says we were cheated. We should have gone with him, he says. That's the way it always seems to be. You think you've gotten a good deal, and someone tells you you were cheated. 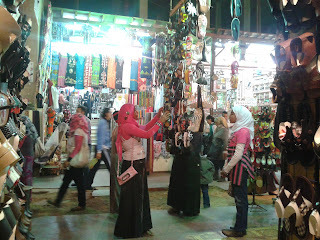 The souk is fascinating - lots of clothes, cheap dishes and blankets, gaudy jewelry. It looks less tourist-oriented than Khan-el-Khalili in Cairo. Peter buys sandals for 200LE. When we get back to the hotel, we have to walk past all the shops to get to our room, so we can't avoid meeting the hotel shoe vendor. "Why you not buy my shoes?" he demands. He is outraged when Peter says he bought a pair at the souk. He looks at them and says they're junk, and they cost far too much. Mahmoud meets us on the street after we leave the souk. He offers to take us to Kalapcha for 100LE for both of us, and to Philae Temple as well. Yassir at the hotel would charge $45 a person. A hundred pounds is only about $20 - and that for two. I'd rather give Mahmoud my business, to a man who's too poor to get married. But we're not sure we really want to go to Kalapcha. We walk along the Corniche, and Mahmoud tells us interesting stories about people at the hotel. 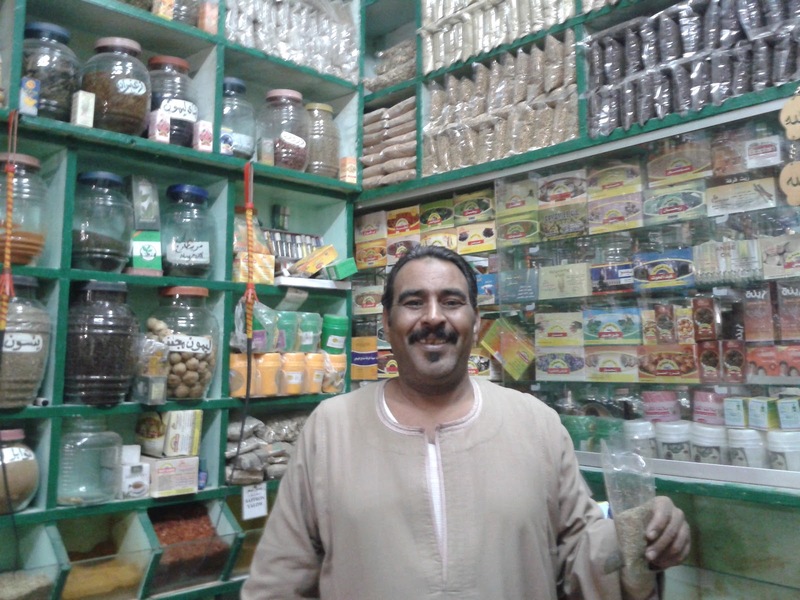 Our liaison, Yassir, used to be a tailor at the hotel, but he had connections, so got the job as concierge. Now he makes even more with his side business of organizing trips. He tells us that Abdul, our perfume scalper, doesn't want us to tell anyone about his trip with us, because the hotel sells oils, and he wouldn't get a cut on these. He says Abdul told the staff he had a doctor's appointment. How does Mahmoud know so much? Is he part of a spy network? Mahmoud seems nice and honorable, but how are we to know for sure? Everybody here is a hustler, and they don't let up for a second. Money is by far the uppermost thing on their minds. I can understand that, though, when tourism is at an all-time low and these people are rock-bottom poor. Still, there's no real peace when you're around them, no matter how religious they may be. Yassir has a bruise on his forehead from praying so much, but he seems to be as bad as Abdul at trying to lure money out of us. Nevertheless, we have promised Yassir our business for the next day. We'll go on his trip to the camel market in Daraw. Of course, he's also tried to organize a falouka ride for LE50, but we have ours with Mahmoud planned already.